Overlooked, practically forgotten, rarely mentioned. It is not summer savory, the more commonly known and grown herb. It’s peppery, spicy, bold, distinctive. A wonderful addition to hearty soups, vegetables, beans, and chicken, fish and meats. And, it’s very easy to grow. 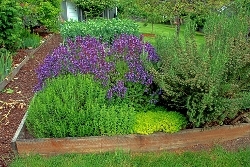 It is an evergreen perennial, so plant it once, instead of annually like summer savory. It likes sun and well-drained soil. It’s hardy, grows well in Zones 5-8. The plant in these photos is 3 years old. Most sites suggest that the flowering shoots are the best part of the plant for culinary use. Mine hasn’t bloomed yet, but the leaves of the young shoots are very flavorful. Apparently the flavor does not stand up well to over-cooking, which must mean high heat. I’ve simmered soups flavored with winter savory, with no loss of flavor. Winter savory is Satureja montana. Summer savory is Satureja hortensis. Montana and Hortense. Siblings, but not twins. Satureja is a genus of aromatic plants of the family Lamiaceae, related to rosemary and thyme. 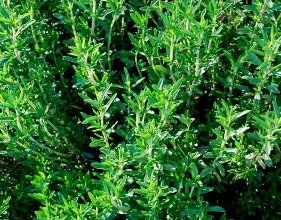 There are about 30 species called savories, of which Summer Savory and Winter Savory are the most important in cultivation. See this Wikipedia article. It seems that there is a caterpillar of a moth that feeds exclusively on Winter savory. Not on mine, I hope. The leafy sprigs are easy to dry. Spread freshly cut sprigs in a wide shallow basket lined with a paper towel or parchment paper, then let dry on the dining room table. That’s what dining room tables are for. In summer. When it’s more fun to eat outside. Or tie sprigs in bunches with kitchen twine and hang over the dining room chairs. You can recover your dining room when cold weather arrives, and your dried herbs are safely canistered in the kitchen. 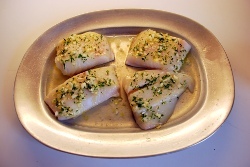 A friend brought us some halibut from Alaska. Here’s what we did with it. 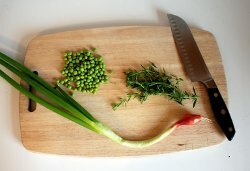 Served with a salad of fresh garden lettuces and orange slices, and steamed baby peas from the garden slathered with honey-butter. Yum. 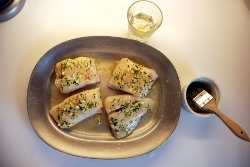 Thaw halibut fillets, if necessary; pat dry. Place on lightly greased shallow broil-proof pan. Brush on butter-savory mixture. Pour white wine to a depth of about 1/8th inch or so. 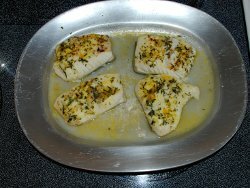 Don’t pour wine over the fillets; wouldn’t want to disturb the brushed-on flavors. Broil 6 inches from broiler coils, about 5 minutes. Flip, brush with leftover butter-savory mixture (or just butter, if you were too generous on the first side.) Broil another 5 minutes, or until fish flakes easily. Combine all, microwave briefly to soften butter. Add salt and freshly ground pepper to taste.